In July 2017, China announced through a World Trade Organization (WTO) filing that it planned to ban 24 types of solid waste and recyclables, particularly post-consumer plastics and mixed paper, and would impose a 0.3 percent contamination rate (later changed to 0.5 percent) on other materials. Initially, the move was greeted with some skepticism given China’s heavy dependence on imported recycled commodities to run its mills and manufacturing plants and the subsequent shortage of domestic feedstock and soaring prices in China. However, in January and March 2018, the ban and new contamination standard, respectively, went into effect, and by all reports, has been enforced. In essence, it appears that China’s recent focus on cleaning up its environment and boosting its domestic recycling infrastructure has trumped its domestic manufacturing priorities and concerns. A recent Chinese letter through the WTO in response to U.S. comments would indicate that China is fully aware of what it is doing and its impact. China imported 16.2 million tons of U.S. recyclables in 2016, or more than 40 percent of the total U.S. recyclables exported (and more than 30 percent in 2017), and 13.2 million tons are now being diverted from China to other markets. As noted during the SWANA webinar by Susan Robinson, director of federal affairs at Waste Management (WM), WM (a good barometer as the largest U.S. recycler) shipped 27 percent of its fiber to China in 2017, which fell to 5 percent in the first quarter of 2018 and to zero in May. The U.S. domestic average old corrugated cardboard (OCC) price has dropped nearly 60 percent from last summer, though it seems to be stabilizing at $67, $66 and $68 per ton for May, June and July, respectively, according to RISI. In the case of mixed paper, it remains virtually worthless and increasingly has to be landfilled. On the bright side, PET, HDPE and metals have domestic (U.S.) outlets, and pricing has been stable. But, mixed plastics #3 to #7 in large part have no market. It is estimated that only 35 percent of materials out of a single stream materials recovery facility (MRF) have positive value, and processors have to pay to move 65 percent! The decrease in pricing has been exacerbated by the cost side—Robert Smouse, assistant director of solid waste for the City of Fort Worth, Texas (who also participated in the SWANA webinar) noted that its processing costs went up $50 per ton overnight from March 31 to April 1, as the city struggles to improve the quality. In large part due to the wide adoption of single stream, contamination rates now generally average in the 20 percent to 25 percent range; thus as noted by Robinson, every ton coming into WM’s MRFs contains 450 pounds of contaminates, versus the 10 pounds maximum required by China, and she also noted that processing costs are up 15 percent for WM on average. The cost side has also been impacted by higher shipping costs and logistical issues. The Solid Waste Environmental Excellence Protocol (SWEEP) compiled recycling data that Waste Dive has collected and concluded that as of June 2018, 34 states, or 68 percent, were reporting either a “noticeable” (24 states) or “heavy” (10 states) impact from China’s actions. On top of the ban and the contamination standard, in May 2017, the Chinese government began to stop renewing import licenses, which further impacted the export of U.S. recyclables, and though China has since restarted issuing licenses, the latest round of allowed import tonnage is the lowest yet this year. In May 2018, it suspended all inspections of U.S. imports for a month, essentially halting U.S. exports to China for that time period. Although this was lifted, markets have again been upended with pre-certification inspection requirement flip flops. Previously, certain shippers had been allowed self-inspection, but apparently, this has been replaced with a requirement for third-party (Chinese approved) inspectors and inspections in U.S. facilities. Given the shortage of these inspectors (and their cost), compounded with the cost of space as loads await inspection, hopes for a second half fiber pricing recovery have dimmed. In the wake of the Chinese actions, alternative markets, notably India and several Southeast Asian countries, have received markedly increased import tonnages, but given the sheer size of the tonnage diverted from China, these markets have become absolutely saturated, with port constraints and rising pollution complaints on the rise. As a result, most of these markets are now clamping down on imports in various ways—Thailand has (temporarily) halted plastic scrap imports, while major Vietnam ports have put a four-month moratorium on all scrap plastic imports, and Indonesia now requires 100-percent, pre-shipment inspections for fiber. Although these countries are currently not expected to impose the draconian measures China has, more restrictions are certainly expected on a permanent basis. Will the China Market Ultimately Disappear? 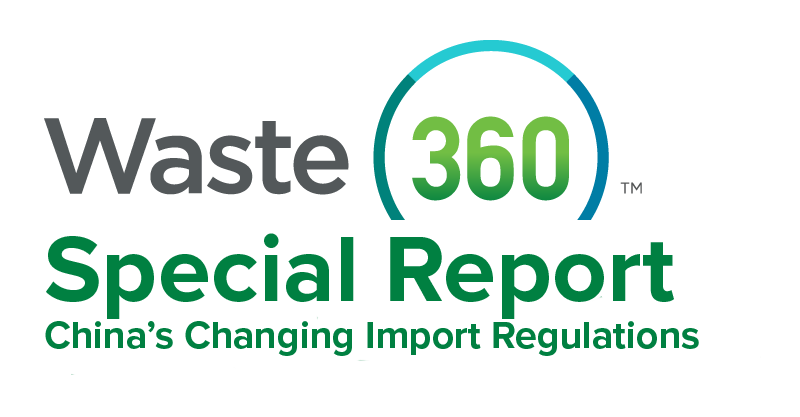 On June 24, 2018, the China State Council put out a white paper reaffirming its commitment to eliminating all recycling imports by the end of 2020. This is obviously in concert with the Chinese leadership’s desire to build its own domestic recycling infrastructure, especially as China’s middle class expands and the economy becomes less export driven. Several industry experts, notably industry analyst Michael E. Hoffman of Stifel, have speculated that the Chinese authorities are looking to force the emergence of a circular economy in China—a closed loop system, as a broader approach to long-term waste management skipping modern landfill for a combination of waste-to-energy and recycling. That would mean China supplies its own manufacturing feedstock from recycled commodities, and essentially bypasses a large part of the solid waste handling evolution that the U.S. has gone through. He notes that there is precedent for this on the telephony front, where China essentially skipped analogue and went straight to digital. Ultimately, the U.S. may have to wean itself off the China market completely. As has been noted by so many industry participants, events of the past year are forcing a reset on the recycling industry. First, as the thing recycling companies can most immediately control, there is a concerted effort to reduce contamination in the bale—both in the MRF process and through customer education efforts—“when in doubt throw it out”—in an effort to combat “aspirational” recycling. This is being followed by widespread efforts to change contracts to reflect the new reality, notably instituting processing fees and engaging in dialogue to make it clear that recycling is not free. The need to build domestic recycling infrastructure in the U.S. is paramount but both expensive and time consuming. That said, there has been some initial activity. First, on the plastics side, there have been several announcements of investment in U.S. processing capacity to produce flakes or pellets (and even fuel), which are still accepted in China. More recently, there has even been activity on the fiber side. Nine Dragons is buying two paper mills in the U.S. to supply its Chinese plants, which again indicates the Chinese change is secular. But, more importantly to the viability of the U.S. recycling industry, Pratt is expanding its use of mixed paper with a new plant in Ohio, which is opening in the summer of 2019, while Green Bay Packaging, a paper company in Wisconsin, just announced plans for a green field paper mill using recycled feedstock, which would be the first new plant in the state in more than 30 years! Lastly, though not confirmed, there have also been rumblings about reopening mothballed plants, particularly in the Pacific Northwest, which has been particularly hard hit by the China actions.